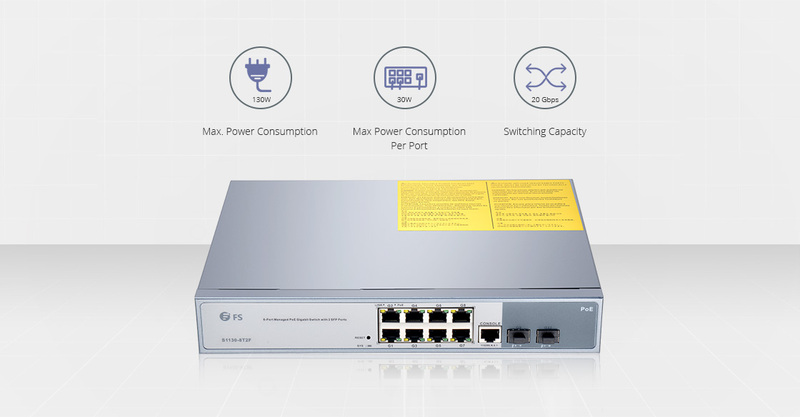 Gigabit PoE switch, or power over Ethernet switch, has seen massive adoption these days by providing improved network flexibility and performance. A Gigabit PoE switch transmits both data and power supply simultaneously to network devices such as VoIP phones, Wireless AP and network cameras without changing existing Ethernet cabling structure, which in turn, greatly reduce the cabling complexity as well as the cost of installation and maintenance. 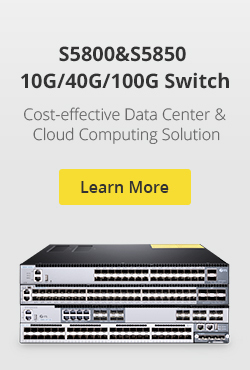 These exists 8/10/16/24/48 port PoE switches with gigabit speed and essential managing functions, among which a 8 port Gigabit PoE switch is poised as a cost-effective choice for home and business use. Let’s see what we can achieve with a 8 port PoE switch. 8 Port PoE Switch: Managed or Unmanaged? Like choosing a standard data switch, we’ll inevitably find ourselves in a dilemma: should we choose a managed or unmanaged Gigabit PoE switch? The answer is pretty easy and straightforward – a managed PoE switch is always better. Managed switches typically offers advanced security features and allows for administrators visibility and control. Besides, a managed PoE switch also offers higher level of manageability and control, so you’re able to program each port individually while keep the network operating at peak efficiency. This results significant saving on power and cost. Additionally, a managed Gigabit PoE switch is capable of configuring, managing and monitoring the LAN – setting/disabling the link speed, limiting bandwidth or grouping devices into VLANs. How to Use a Managed 8 Port PoE Switch? Managed Gigabit PoE switch has become a preferable option for enterprise networks, with dramatically decreased price, expanded feature sets and improved ease of use. Experience from those who have dealt with a 8 port managed PoE switch also demonstrates that this is a journey well worth taking. You can use a managed 8 port PoE switch to creates VLANs and limit access to specific devices, to use Layer 3 routing capability and to remotely monitor network performance. 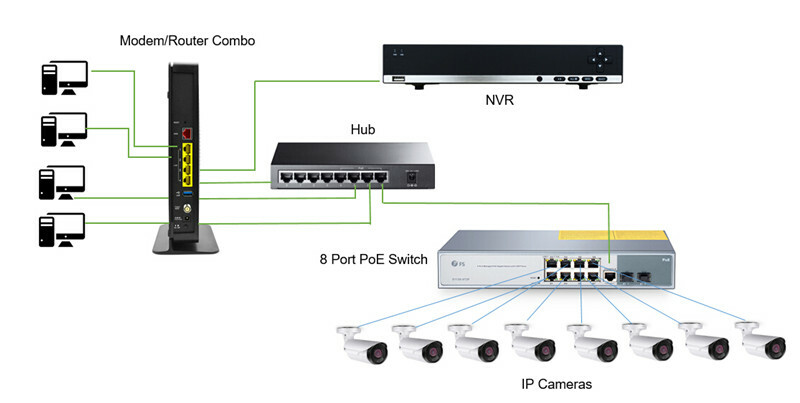 Common applications of a managed 8 port PoE switch includes the following aspects. To connect this PoE enabled device, you need to know the power consumption of these device, as well as a total power/ power per port of your PoE switch. For example, you have a managed 8 port PoE switch with a power budget of 250W with the maximum power consumption per port 30W. Assume to power an IP Camera network, you’ll need a total power per port of 30W. 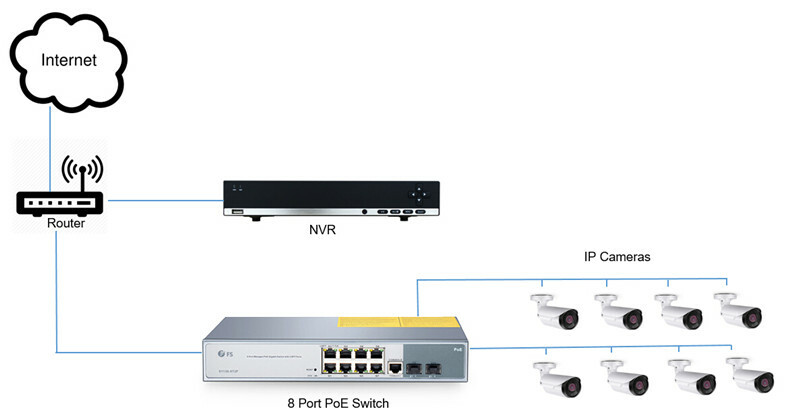 Then you can connect all the 8 ports with IP cameras with a total power consumption of 240W (within the budget of 250W). Voice over IP phones Enterprise can install PoE VoIP phone, and other Ethernet/non-Ethernet end-devices to the central where UPS is installed for un-interrupt power system and power control system. Wireless Access Points Museum, sightseeing, airport, hotel, campus, factory, warehouse can intall the WAP anywhere. IP Camera Enterprise, museum, campus, hospital, bank can install IP camera without limits of install location – no need electrician to install AC sockets. The key applications are illustrated as following. One of the frequently asked question is that whether we can mix PoE and Non-PoE devices on the same PoE network. The answer is positive. PoE will only send power if it requested by the device. Otherwise the switch just interacts with it as if it were a regular switch. 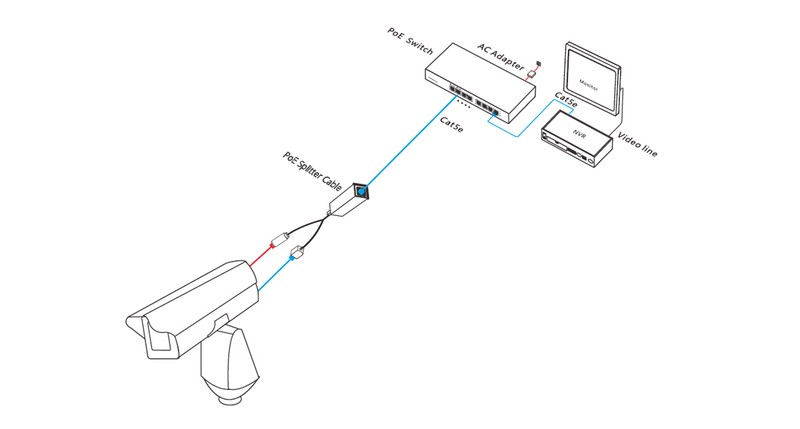 When connecting a managed 8 port PoE switch to non PoE compatible devices, a PoE splitter is commonly adopted – it delivers data and DC power through separate connections. Managed gigabit PoE switch has become a better choice if you ever anticipate advanced network features to meet business growth. A managed 8 port PoE switch is the best fit for SMB network and home use with relatively small traffic flow. 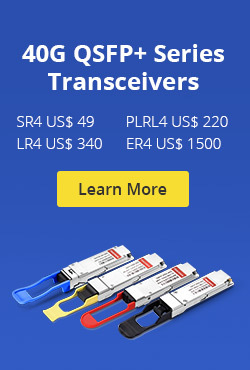 FS.COM fully understands customer expectations and offers managed 8 port PoE switch with the price starting from $159. Besides, we also provide 24 port PoE switch and 48 port PoE switch to help future-proof your network and unleash the potential of your business. Feel free to contact us via sales@fs.com for more solutions. This entry was posted in Network Switches and tagged 8 port poe switch, data switch, gigabit poe switch on June 29, 2018 by Aria Zhu.